Amish cemeteries use wooden grave markers and others use stone. 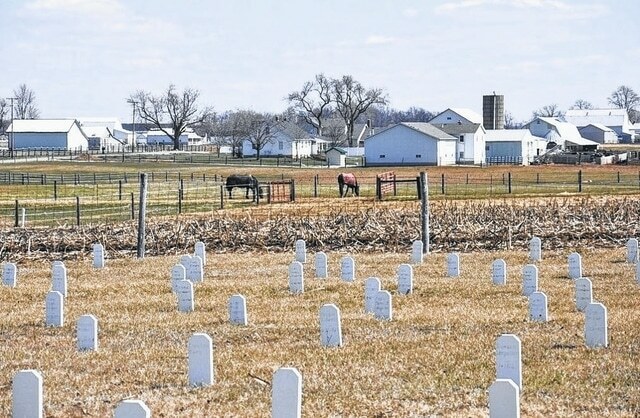 This is an Amish cemetery in Allen County, Indiana. Hello. Greetings to each of you. Is life meant to be fair? There are times when I can’t help but ask that question. At the moment, myself, my husband, Daniel, Julia and Austin are traveling to Jamesport, Missouri, for the funeral of a 45-year-old lady, a friend of mine, named Ruth Ann Bontrager, who passed away. Only 5½ weeks ago she was diagnosed with the dreaded word: cancer. She left behind a husband and six children, three girls and three boys ages 22 to 8. Oh, how my heart aches for the grieving family. Life certainly doesn’t treat us all the same. We don’t have the same valleys, callings, or face identical trials or pass through the same valleys. I’m comforted by the thought that our all-knowing God never makes mistakes or gives us more than we can handle. Even in the midst of difficulties, when there’s no way we can see our way through, His love never fails to carry us through it — if we look to Him one step at a time. Hi, I’m back again. It’s a day later and we’re homeward bound. The funeral is past and, if all goes well, we should be home by midnight. Have you ever witnessed an Amish funeral? This morning we arrived at the homestead where the services were planned to be held. There were long rows of buggies parked in a field designated for buggy parking. Flatbed wagons had been parked in the field as well where the horses had been untied after being unhitched. We joined other visitors in the tent which had been erected for the services. Soon I was sitting beside my mom with Austin in my lap. I was in the midst of a sea of Amish people. The ladies, all dressed in black, sat on one side with the men — in white shirts and black suits — on the other. My mind traveled here and there. I couldn’t help but marvel at the thought of all the working together it must have taken to plan and coordinate everything. There were close to 1,000 people at the funeral. Those who were closely related to Ruth Ann sat in a shop for the services while other friends gathered under a large tent. After the services, everyone filed past the casket to view the body one last time. When everyone else had their turn, the family all gathered around their dear mother as they wept together once more. The casket was then closed and loaded into a horse-drawn hearse. A long line of buggies stood waiting to transport the family, siblings, and aunts and uncles to the graveyard. At the cemetery, family and friends once more gathered in a huddle — this time around the freshly, hand-dug grave. A passage of Scripture was read and several German songs were sung while the casket was gently lowered into the grave and covered. Watching a body being laid into a grave is a sobering occasion indeed. We all know that our earthly bodies aren’t meant to live forever. But praise be to God — if we live for Him, we will live with Him in Heaven some wonderful day. Lunch had been prepared for everyone as well. It was a typical meal served at an Amish funeral. They had a food line where they filled trays with sandwiches, noodles, potato salad and tapioca. Each person could then choose from a wide variety of pies and cakes. It was amazing to see how efficiently everything was organized. How about trying out the recipe for potato salad that is most often served at occasions like this in my family and community? My grandma’s recipe is one everyone uses. It’s a simple recipe but has a wonderful combination of tasty and tangy. You should make it the day before to really let the flavors mix. Another way to enjoy this salad is to make it a “potato macaroni salad.” Cut back the amount of potatoes by half and however many cups of shredded potatoes you come up with, add an equal amount of cooked macaroni and follow the recipe. We really enjoy it that way. Cut potatoes in half and put into a pan of water so they are just covered. Cook potatoes in boiling water and when it reaches a boil, turn to low and simmer until fork tender. Add eggs, onion and celery. Mix together dressing ingredients, then mix with first mixture. It’s best when made the day before you plan to serve it. If it seems a bit thick, add more milk. Makes two quarts and serves 16.